High Marks For Brady But What About the Defense? 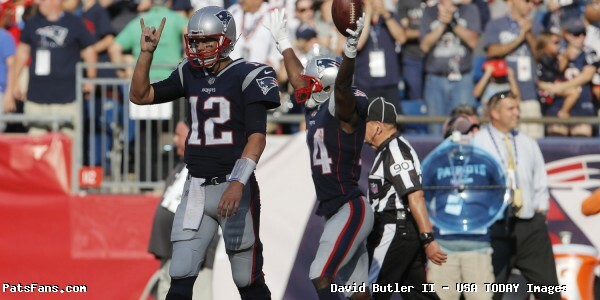 The Patriots pulled out another win thanks to the continued brilliance of Tom Brady and were able to come from behind and defeat the Houston Texans 36-33 on a pass from #12 to Brandin Cooks with just 23 ticks left on the clock. But there are some serious questions to be asked about the defense. New England’s defense now ranks 32nd in yards and more importantly 32nd in points allowed. A Houston team that had scored 20 points in its first two games lit them up for 33 and left some more points on the field. Tom Brady was looking anything like the 40-year old that is A.) About to fall off a cliff. B.) Can’t throw the deep ball anymore, C.) A dink & dunk system QB on Sunday. Take your pick…did we leave any out? Rob Parker? Brady was under duress all afternoon and was sacked 5 times (4 by Houston and one by James White’s foot) and still managed to complete 25-35 for 378 yards and five TDs. Houston hadn’t allowed a 300-yard passer in over thirty + games. No more. He was 5-8 throwing the deep ball and had the Texans very confused on the back end. He froze the deep safety by staring down the receiver on the game-winning TD giving Cooks time to get free and lofted a perfectly thrown ball right into the barrel. All of this with Jadeveon Clowney right in his grill. Tremendous poise and coolness under fire….again. The backs weren’t targeted much in this one as they were mainly asked to stay in and either block or chip on their way out. James White had a nice 11-yard catch where he juked the defender and got the first down. But the backs were afterthoughts this week. The running game was stuck in neutral. Mike Gillislee had just 31 yards on 12 carries as there was frequently nowhere to run (Cue up Martha and the Vandellas). These guys had their way with the Texans beat up secondary on Sunday. Chris Hogan scored two touchdowns on 7 and 47 yards that were ridiculously wide open. The wide receivers were creating space on the back end that the Texans couldn’t handle. As good as that front seven is, their backend is a liability. Brandin Cooks caught a bomb to start things off on the Patriots first drive, a really nice catch where he was interfered with and still brought down the pass. Cooks had another nice catch on a 42-yard post where he caught the ball in the middle of the field with separation from newcomer Jonathan Banks and kicked his speed into high gear, leaving him in the dust for an easy touchdown. He then beat Kareem Jackson for the game-winner with under a minute to go. Danny Amendola returned from a concussion and what a difference he made. Again, as we’ve said here many times, don’t judge him by his stats. 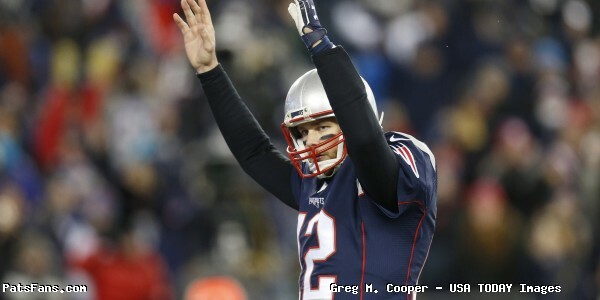 He drew two defensive penalties and his catch on the Patriots final drive on third and 18 near midfield was a beauty. He got a bit of separation from Eddie Pleasant, went high up and came down the ball tucked away. Money. The Patriots got Rob Gronkowski back after tweaking a groin in New Orleans and he had a typical Gronk game. The big man had 8 catches for 89 yards and a touchdown and was giving the Houston safeties fits. He did a very good job of blocking, several times staying in to block JJ Watt or chip him on his way out in the pattern. Dwayne Allen is really struggling right now, he had another drop and has zero catches so far this year. No one was expecting huge numbers from him but not this either. His blocking was okay but he did get taken to school on one play by Whitney Mercilus, but lots of guys do. Jacob Hollister had a nice catch down the seam for a nice game and then took a big shot but once again showed he was able to hold onto the ball. I think we’ll see more of him moving forward. The offensive line didn’t have a good day. With Marcus Cannon out the team used Cam Fleming and LaAdrian Waddle and both of them had issues. JJ Watt blew threw each on the first two plays of the game and had run stuffs behind the line. Nate Solder is playing hurt and was beaten on several plays. The interior of the line fared little better. Joe Thuney was pushed back violently by Watt and fell into Solder’s legs, allowing Clowney a free rush and he crushed Brady. On a day where the line allowed five sacks and opened precious little running room for the running backs, they didn’t have their best day. But as we pointed out, Houston’s front seven is among the best in football. The Patriots defensive line set up to stop the run, frequently putting ten men in the box, practically daring the rookie QB, DeShaun Watson to throw. And despite that, with an offensive line playing pretty horribly and being banged up, the Texans ran for 125 yards on the ground. That isn’t getting it done. They had a hard time bringing down the elusive, eel-like Watson on several plays, but one has the feeling that we’re going to see a lot of that moving forward. The pass rush was inconsistent but did get some pressure at times. Cassius Marsh had a pretty good day with a sack and a couple of pressures. Deatrich Wise was bearing down on Watson early in the game and forced him into an errant throw that was easily picked off by Stephon Gilmore. But the line stepped up big at the end of the game with Alan Branch and Malcom Brown stuffing a 3rd and 1 at the Patriots 18-yard line forcing a field goal. If Houston converts there, they probably score six and walk away with the win. Dont’a Hightower missed his second game (not surprisingly) and Kyle Van Noy played every snap on defense. He had some up and down moments but he guessed wrong and went for a pick on a pass to D’Onta Foreman in the flat. He didn’t get there and Foreman rolled for a 34-yard gain. His diving play on Lamar Miller was a beauty, stopping him from breaking off a big gain. Elandon Roberts was mostly solid in the run defense but is still a liability in coverage. David Harris is still MIA. The team played a lot of zone coverage because of the presence of a running QB and as we’ve said before, this team doesn’t do zone well. Once again the big plays killed the secondary where they allowed a rookie QB to throw for over 300 yards on the day. The secondary allowed six passes of more than 20 yards. 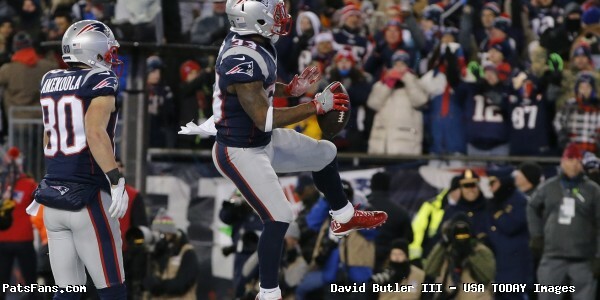 Malcolm Butler returned to the lineup with Eric Rowe injured and played well. Gilmore had an up and down day. He had an interception and a nice return but then took a needless penalty on a deep throw where he had good coverage as well as safety help. Jonathan Jones struggled on the day and was picked on a bit. Pat Chung gave up a big play as did Devin McCourty who was beaten for a touchdown to Ryan Griffin in the end zone. Unfortunately, we’ll probably see more zone this week as Cam Newton is coming to town. Stephen Gostkowski made all of his extra point attempts and his kickoffs were perfectly placed allowing the coverage units to go down and make plays. With Nate Ebner back, they did just that. Brandon Bolden made two very good plays on the coverage team. Amendola’s return re-ignited a sleepy return game and he had big returns of 33 and 20 yards. The first of which set up the Patriots first touchdown (Did we say $$$). Ryan Allen was okay, he put three punts inside the 20 but when they were pinned deep, he shanked one, giving the Texans excellent field position. But the overall coverage units were outstanding and this week. Once Matthew Slater returns, we expect it to get even better. Bill Belichick’s best move of the day was allowing his team to be itself. There was none of this phony, “we’re all going to kneel or none of us are” BS or anything else. He let the players decide how to handle it and they seemed to become closer as a group because of it. The comments after the game seem to echo that. Brilliant move on his part. However…. We can stop with the narrative about rookie QBs facing a Bill Belichick defense for now. 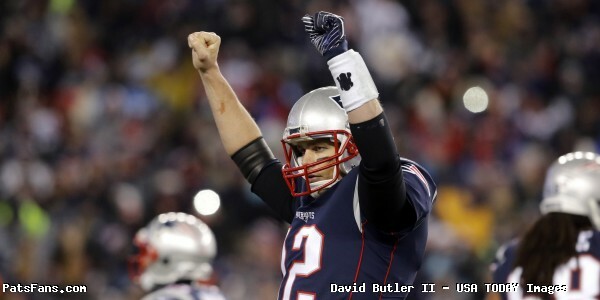 Yeah, sure they won the game because of the continued magnificence of Tom Brady. But it was Watson who for the vast majority of the game who took Belichick and Matt Patricia’s defense to school and the Texans who weren’t supposed to move the ball at all this season, pushed the Pats defense around easily. They tried to confuse Watson by constantly bringing ten men up in the box and daring him to throw….he did. The problem was, they never came thru with the threat of bringing pressure and Watson wasn’t intimidated at all. Offensively, the plan was simple, they were going to attack the deep part of the field, and despite the issues on the offensive line, they accomplished that quite well. We could get nit picky with a few of Josh McDaniels play calls, but against that defense, putting up 36 points….is a very good day. This entry was posted in 2017 Patriots Season, Patriots Commentary and tagged 2017 Patriots Season, Bill Belichick, Brandin Cooks, Cassius Marsh, Chris Hogan, Danny Amendola, Deatrich Wise, Deshaun Watson, Dion Lewis, Houston Texans, Jadeveon Clowney, James White, JJ Watt, Malcolm Butler, New England Patriots, NFL, Patriots, Patriots edge rushers, Rob Gronkowski, Tom Brady, Trey Flowers, Whitney Mercilus on September 27, 2017 by Steve Balestrieri. For fifty-seven and a half minutes, the Houston Texans worked hard to erase a lot of bad memories in Foxboro. 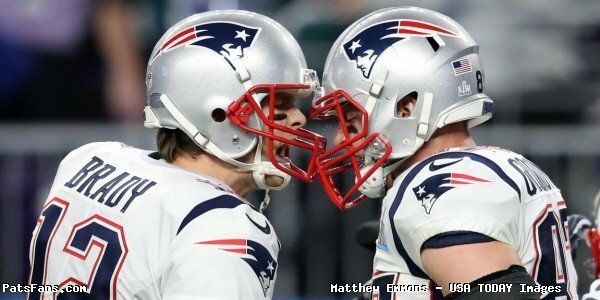 They went toe-to-toe with defending Super Bowl Champions and using an outstanding front seven of their defense and an up and coming rookie quarterback who frustrated and flummoxed the Patriots defense, they were in a position to win for the first time in New England up by a score of 33-28. But the Patriots have Tom Brady and as he showed in February, he’ll be a 60-minute man and beyond. And he was at his very best once again when the chips were pushed into the middle of the table. Brady and the Patriots offense took over at their 25-yard line with 2:24 to go and actually went 85 yards thanks to a penalty that pushed them back to the 15-yard line. Facing a second and twenty, Brady went to Rob Gronkowski two times to get the key first down. Later facing a third and eighteen, he hit a strike to Danny Amendola. Then the beauty to Cooks, a high-arcing pass that Brady dropped right into the bucket from 25 yards out with just 23 seconds to go for another improbable comeback win. But those seem to happen with such regular occurrence that sometimes we forget how special they are. Cooks had his man beaten cleanly and had to wait for the ball to come down, making a great catch while catching a forearm to the head and doing a great toe-tap to stay in bounds. Brady described the play to the press after the game as he did a great job to look the safety off to give Cooks a one-on-one shot and he delivered. Brady finished 25-35 for 378 yards with 5 TDs and 0 Interceptions for a ridiculous passer rating of 146.2 despite being under pressure most of the day. Cooks finished with 5 catches for 131 yards and two big touchdowns. As we said in our pregame matchups, this was the reason the Patriots brought Cooks in this spring. Houston took away the middle of the field on those short/intermediate routes but Cooks with Hogan, now give the Patriots the speed to challenge opponents on the perimeter. And as good as Houston’s front seven is, their secondary was being ripped by Brady when he had time to throw. His first completion of the day was a 44-yard bomb to Cooks on third down which set up a short Brady to Gronkowski touchdown pass. He also had a 42-yard score where he ran a post and then easily outran the coverage to the end zone. Brady also hit Hogan for two scores a 7-yarder and a 47-yarder which were ridiculously wide open. Watt Off the Score Sheet But Was a Big Influence: Texans’ DL J.J. Watt may not have gotten a sack in the game but don’t think for a second that he wasn’t influencing things. The Patriots doubled him on nearly every snap, and on plays that they didn’t he was chipped by Gronkowski on the way into the passing routes. The first two plays of the game Watt dropped runners for a loss and on the pancake sack by Jadeveon Clowney, it was all set up by Watt. He bull-rushed LG Joe Thuney and shoved him into the back of Nate Solder’s legs sending them both tumbling. Clowney then had a clear path to Brady’s blind side and pancaked him to the ground. Just because Watt didn’t register a sack doesn’t mean that he wasn’t influencing things out there. The Patriots were doubling him for a reason. I thought he played a very solid game. 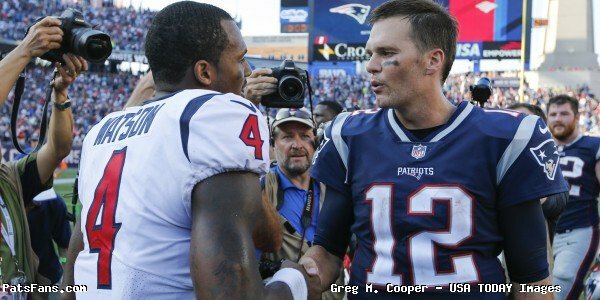 Patriots Showed A Lot But Didn’t Come After Watson: Bill Belichick and Matt Patricia bluffed a lot, frequently putting ten men up in the box, practically daring QB DeShaun Watson to throw. But without the benefit of rewatching the tape yet, they didn’t blitz him much, if at all. And Watson hung in there, and for the most part had plenty of time to throw. When he didn’t, he bought time with his legs, showing an amazing ability to escape and deliver the ball. Watson finished 22-33 for 301 yards with two touchdowns and two interceptions. Although he had a couple of balls sail on him, he was pretty accurate for the most part. He had really only one bad throw, his first pick was a throw right to Stephon Gilmore. Heat Took it Out on Both Teams: The unnaturally hot day was more akin to an August training camp practice than it was to a late September game with temperatures on the field over 90 degrees. Gilmore had to leave due to heat issues in the second half but did return. His absence left the team short for a spell. WIth Eric Rowe out, it left the team with Malcolm Butler and Jonathan Jones on the outside. With that thought, both Butler and Gilmore played pretty well today. The main issues with the secondary were once Watson broke free from the pass rush it invariably means someone is going to get open downfield. Situational Football Fail Early in the 4th Quarter: After the game, Bill Belichick spoke to the press about how the team in the final few minutes, excelled in situational football which was true. However early in the fourth quarter, the team had a situational failure that nearly cost them. On their first possession of the quarter, the Patriots faced a third and one and they rushed up to the line and tried to snap the ball quickly to catch the Texans off guard, a run to Mike Gillislee. The Patriots have been going to the well one too many times with that particular strategy and teams aren’t going to fall for it anymore. 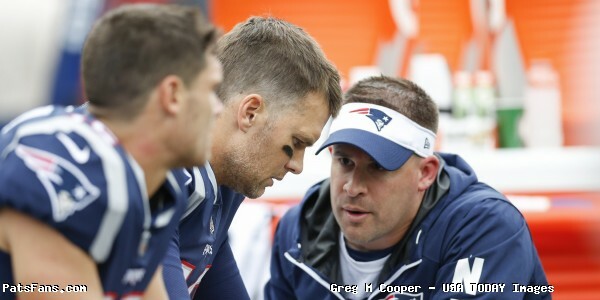 Facing a Houston Texans team with Bill O’Brien, Romeo Crennel, Mike Vrabel, Larry Izzo and Wes Welker on the coaching staff who have all been part of so many Patriots games where they used that strategy….it wasn’t going to fool them. The Texans were ready and easily stuffed the play. Josh McDaniels should have known that, taken his time and gotten the first down. That was a big momentum swing the other way. With that being said…. Defense Has a Long Way to Go: There is no other way to sugar coat this one…the defense has a lot of work to do. Thru three weeks, this unit lacks a finish and they get passive at times, as they always have, against running QBs. Watson resembled anything but a rookie for much of the game on Sunday and there remain many issues to fix. Oh, and there is another running QB coming to Foxboro next Sunday. Cam Newton looked awful against the same New Orleans defense that Brady scorched last week. He threw for only 167 yards, no touchdowns, and three picks on Sunday. Somehow, I don’t see a continuation of those type of numbers next week. Running Game Stuck In Neutral: Before the game, too many people were looking at the stat sheet and saying the Houston run defense was weak, after their Week 1 debacle against Jacksonville. We pointed out here, that was more of an anomaly and running was going to be an issue for the Patriots. And unfortunately, we were correct. The running game never got untracked and the first two possessions of the fourth quarter ended with the team failing on third and one …twice. That is unacceptable and needs to get fixed. The offensive line was getting no push on those plays. The team rushed 20 times for just 59 yards. While the Texans have one of the best front sevens in football, the Patriots have come up short in five short yardage plays already this season, three against Kansas City and the two against Houston. While Marcus Cannon was out and Nate Solder has been playing hurt, it is more of an offensive line issue than one with the RBs, especially Mike Gillisllee. Gronkowski Has a Big Game: Questions were around all week if tight end Rob Gronkowski would play this week after tweaking his groin in New Orleans, despite him saying numerous times that he was good to go. Well, he played… and was his typical Gronk self. He scored the first touchdown of the game on a pass from Tom Brady and finished with 8 catches for 89 yards. He had two big catches on the final drive got the team going. And he is an outstanding blocker, the team frequently either kept him in to help buy Brady time or had him chip J.J Watt on his routes. But he showed no signs of being injured from a week ago and was a key part of the big comeback win. Amendola was Money Again: I don’t know how many times we’ve written here to don’t judge Danny Amendola strictly by his stats because they’re usually always at a big point in the game and when the team needs it the most. Sunday he was at it again. We looked to him this week to take some of the pressure off of the outside wide receivers and he did that. While he had just three catches for 48 yards, his 27-yarder from Brady on the big third down and eighteen call was immense and set the table for Cooks’ game-winner. Amendola also resurrected the return unit which had zero yardage last week. He had two big punt returns for 53 yards which flipped field position and set the team up in both cases. 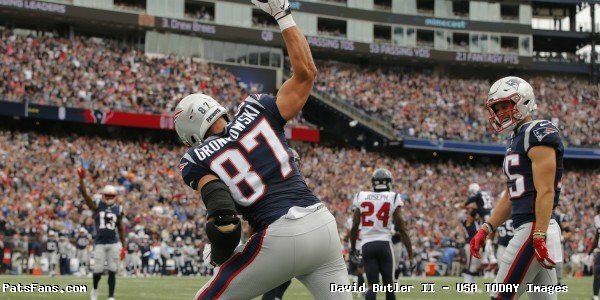 With Julian Edelman out for the year, players have to step up and Amendola did his job …once again on Sunday. He isn’t the biggest guy on the field, but he’s clutch and has arguably the surest hands on the team. 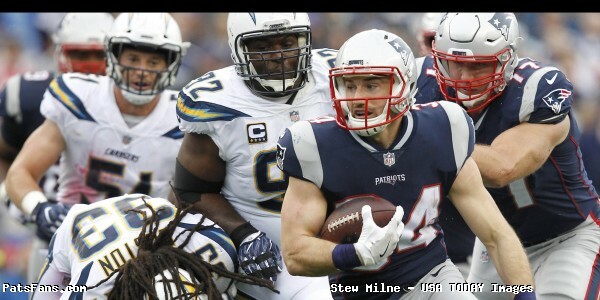 This entry was posted in 2017 Patriots Season, NFL Commentary, Patriots Commentary and tagged 2017 Patriots Season, Bill Belichick, Brandin Cooks, Chris Hogan, Danny Amendola, Deshaun Watson, Dion Lewis, Houston Texans, Jadeveon Clowney, JJ Watt, Julian Edelman, Malcolm Butler, New England Patriots, NFL, Patriots, Patriots edge rushers, Rob Gronkowski, Tom Brady on September 25, 2017 by Steve Balestrieri.